The Women Together Award recognizes men and women who actively promote ethical, philosophical, moral, economic, scientific and cultural values that open new horizons for the future of humanity. They also recognize personal and institutional achievements, mainly those that constitute a relevant contribution to universal culture and help in reaching the UN Sustainable Development Goals. 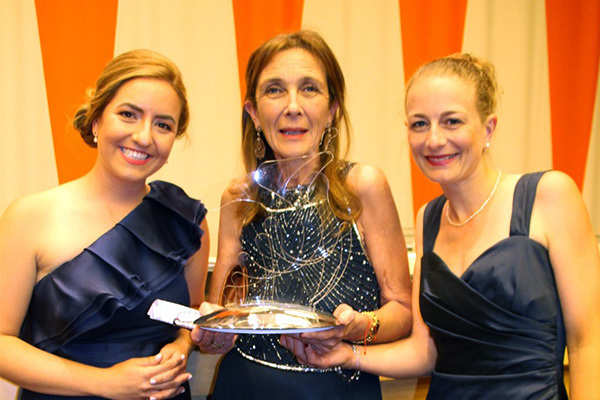 Dr. Pilar Silverman, Medical Services Director of NPH International, was awarded the Women Together Award at the United Nations building on June 7, 2016, at the Women Together gala. Congratulations Pilar! Good evening everyone. It is a true honor to receive this Women Together Award on behalf of NPHI (Nuestros Pequeños Hermanos International) advocating for children’s wellbeing. In addition to what we show in the video, we are working on a range of health projects focusing on gender equality, serving the community and sustainable practices. We strive to provide the best educational opportunities, starting with early education, to develop their highest potential as human beings. It is with gratitude I want to thank my outstanding team. Part of it is present in the room Dr. Corinna and Marta and Aya from finances department. My family, my husband and children, always supporting and encouraging to fulfill my dream and pursue my passion. And to my mentor and ethical consultant, Fr. Rick Frechette, CP, DO, a priest and doctor for exemplifying life of compassion and giving back the human dignity to the poorest of the poor in the slums of Haiti. Finally to the Aid for Aids foundation, Walkabout Foundation and Dream Project for their partnership. Below is the video that Dr. Pilar showed before she received her award.